Citing limitations with Steam, Notch says a Minecraft release on Valve's digital distribution platform won't happen. 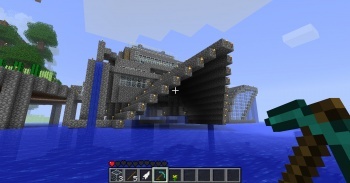 Minecraft creator Markus "Notch" Persson discussed on his blog an "inherent incompatibility" between Valve's delivery service and Mojang's goals for its popular indie block builder. Paired with EA's recent decision to not release Battlefield 3 on Steam, it seems the platform's supposedly restrictive terms will cost the service a few highly-anticipated titles. "Steam is the best digital distribution platform I've ever seen ... but being on Steam limits a lot of what we're allowed to do with the game, and how we're allowed to talk to our users," Notch said via his blog. "We (probably?) wouldn't be able to, say, sell capes or have a map market place on minecraft.net that works with Steam customers in a way that keeps Valve happy." The decision seems to come free of any animosity, with Notch praising Steam's "shift+tab" functionality, stability, and payment options. "So there's no big argument, we just don't want to limit what we can do with Minecraft," Notch continued. "Also, Steam is awesome. Much more awesome than certain other digital distribution platforms that we would NOT want to release Minecraft on." While having Minecraft on Steam certainly wouldn't hurt sales, the game seems to be doing well on its own. Earlier this month, Mojang announced its game had surpassed the three million units sold mark. Have you been holding off in hopes of a Steam release?